As per request, a horrific monster inspired by Resident Evil! You hear clawing, scratching, and clicking throughout the hallways ahead. As you draw closer, the sounds become louder even though they have no discernible origin! The strange sounds cease as a soft hissing fills your ears. As you look up, a large creature made of muscle tissue leaps to the ground with its sharp claws. The beast opens its toothy maw to reveal a massive whip-like tongue. Speed 30ft. ; Climb 30 ft. Languages Understands Common, but cannot speak..
Alerting Shriek. When the Lurker is hit by an attack, it can use a reaction to unleash a horrible scream. While this doesn’t effect its enemies, it alerts any nearby Viral Undead to its presence, as well as potential prey. Undead Fortitude. If damage reduces the zombie to 0 HP, it must make a Constitution saving throw with a DC of 5 + Damage taken, unless it is radiant damage or a critical hit. On a success, the zombie drops to 1 HP instead. Infectious. Any creature hit by its natural attacks risks becoming infected. After being hit by an attack, the target must roll a Constitution saving throw equal to 8 + the Viral Undead’s proficiency bonus (equal to 12, in this creature’s case). If the target fails, they have contracted the Zombie Plague. Scent. Lurkers gain advantage on perception checks using smell. Viral Undead. Lurkers do not give off necrotic energy and cannot be detected by Detect Evil, Divine Sense, or related abilities/spells; despite being undead. Claws. Melee Weapon Attack: +6 to hit, reach 5 ft., one creature. Hit: 13 (2d6+2) piercing damage. The lurker can make this attack twice. A creature hit with either attack roll a Constitution save of 8 + the Lurker’s proficiency (or above 12) or become infected with the Zombie Plague. Whipping Tongue. Melee Weapon Attack: +5 to hit, reach 15ft., up to two creatures within 30 ft. line. Hit: 8 (1d10+4) bludgeoning damage. A creature hit with either attack roll a Constitution save of 8 + the Lurker’s proficiency (or above 12) or become infected with the Zombie Plague. Catch Them Off Guard. When the Lurker hits with Whipping Tongue, it can use a bonus attack action with a +5 bonus to hit to try to knock the target prone. Leaping Charge. When the Lurker elects to do a charge action, it can jump up to its base movement and make a claw attack. Created by Doctor Necrotic for Doctor Necrotic Media. 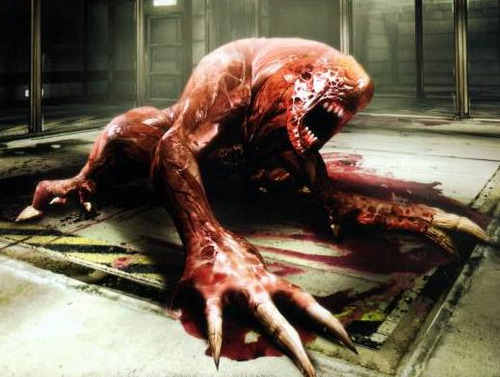 Based off the Licker from Resident Evil, a property of Capcom.